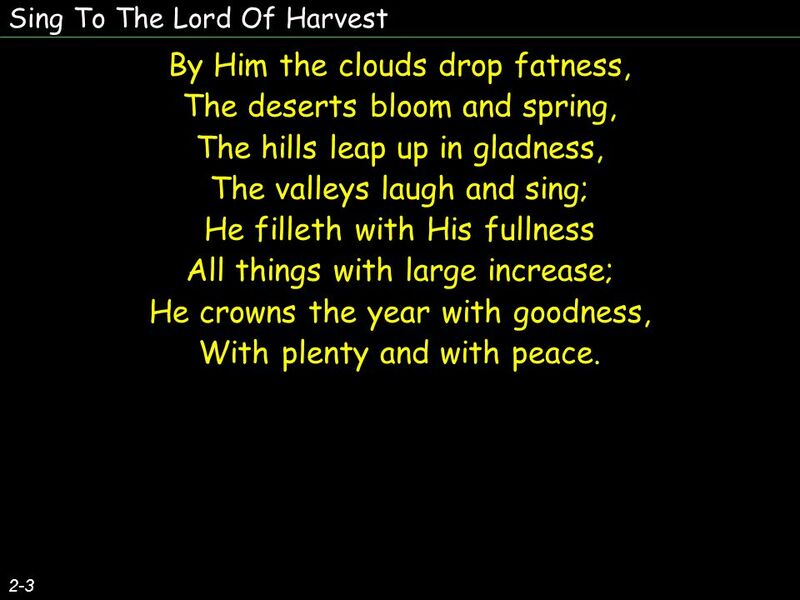 Sing To The Lord Of Harvest Sing to the Lord of harvest, Sing songs of love and praise; With joyful heart and voices Your hallelujahs raise; By Him the. Download ppt "Sing To The Lord Of Harvest Sing to the Lord of harvest, Sing songs of love and praise; With joyful heart and voices Your hallelujahs raise; By Him the." Sing to the Lord with joyful song, Lift up your hearts, your voices raise; To us his gracious gifts belong, To him our songs of love and praise. Hail to the Lord's Anointed, Great David's greater Son! Hail, in the time appointed, His reign on earth begun! He comes to break oppression, To set the. Come, Let’s Lift Our Praise CHORUS Come, let’s lift our praise, Lord, to you our song we raise; We will shout and sing with joy To you, our God. For you. There’s Sunshine in My Soul Today 1. There’s sunshine in my soul today, More glorious and bright Than glows in any earthly sky, For Jesus is my light. Let Everything That Let everything that Let everything that has breath Praise the Lord. I’m singing for my Lord, Everywhere I go Singing of His wondrous love That the world may know How He saved a wretch like me By His death on Calvary. Change & Transition Through hardship we begin to understand about God’s protection. "Sing unto God ye kingdoms of the earth,O sing praises unto him." PSALMS 68 v 32 PSALMS 68 v 32. Crown Him (Majesty) CCLI License # Crown Him with many crowns The Lamb upon His throne Hark! How the heavenly anthem drowns All music but its. Lovely Noise Everything that moves and breathes Sing a song and praise the Lord. Our God is an awesome God He reigns from heaven above With wisdom pow'r and love Our God is an awesome God. That’s Why We Praise Him Tommy Walker. He came to live Live a perfect life He came to be The Living Word of light. I Will Enter His Gates I will enter His gates with thanksgiving in my heart; I will enter His courts with praise. I will say this is the day that The. O when the saints, go marching in O when the saints, go marching in O Lord, I want to be among that number When the saints go marching in! Come Into His Presence Come into His presence with thanksgiving in your heart And give Him praise, and give Him praise. Come into His presence with thanksgiving.